Last year, our Finance Director Alex Whitbread ran in the Brighton Marathon. With significant help from family, friends, work colleagues and local businesses, he managed to raise over Â£1500 for Dementia UKÂ www.dementiauk.org. With that challenge ticked off, Alex decided that this year he would attempt the London to Paris charity bike ride. His friend Justin Couzens agreed to accompany him to share the pain (with over 100 other riders) and together, they set off from Crystal Palace at 7am on the morning of Weds 5th June. 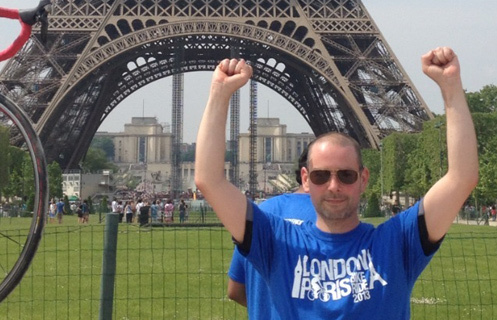 4 days and 310 miles later, they arrived under the Eiffel Tower. The mixture of elation and relief was heightened by the fact that they (Alex and Justin) had raised a further Â£3100 for Dementia UK. A large proportion of the monies were raised through the sale of raffle tickets and special thanks must go, not only to those who bought the tickets, but also to the many local businesses who between them ensured we had a fantastic list of prizes. Guess weâll find out next year! 5/7 High Street Sunninghill Berkshire SL5 9NQ.